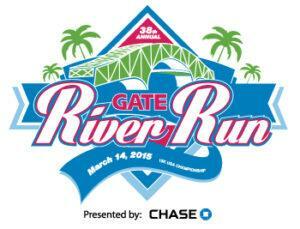 I was stoked for the Gate River Run 15K. After last year’s misery, I had some unfinished business with this hometown race, and I was ready to take it on. Let’s start with the expo. On Friday, Mr PugRunner and I headed to pick up our packets and do some shopping at the Expo. I was so excited to get to meet Anne, from Candy Crazed Run. 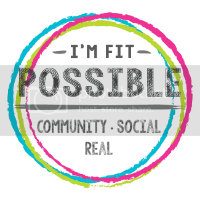 We have become blog friends over the past few years, and it was great to finally put a face to an internet presence. We didn’t get to hang out for more than a few minutes, but I am sure our paths will cross again. Incidentally, we bumped into a lot of friends at the Expo. Also incidentally, I had to buy us matching Green Monster shirts. We checked into the Omni Jacksonville and started to make plans for dinner. The hotel restaurant was offering a few race specials for dinner, but we decided to stretch our legs with a walk across the street to Chicago Pizza at the Landing. We each had a glass of wine and we split a Chicago-style pizza. We also checked out one of the two bridges that would be on the course the next day. So beautiful when you’re admiring from afar. Back in the room, we got our race outfits and supplies ready and then kicked back with Taken 3, rented via the in-room cinema. I was asleep minutes after the movie ended. Even though we were only a few miles from the start line, I wanted to get up and over to the staging area to make sure we were able to get a parking spot. I’m a nut about parking. We took our breakfast with us in the car and had a bit of a picnic as the sun rose. Of course, I had to take a few little potty breaks, but what else is new? As we waited for the 8:30 gun time, we met up with friends and got ourselves warmed up and situated. After a few more bathroom runs, Mr PugRunner and I headed into our corral, where we finally met up with Kristin. The day was already warming up quite a bit. An 8:30 start is nice for getting some extra sleep, but it can also be brutal in Florida. Those cooler minutes before sunrise absolutely count, and it would have been nice to have been running already. Finally, it was time, and we started out. 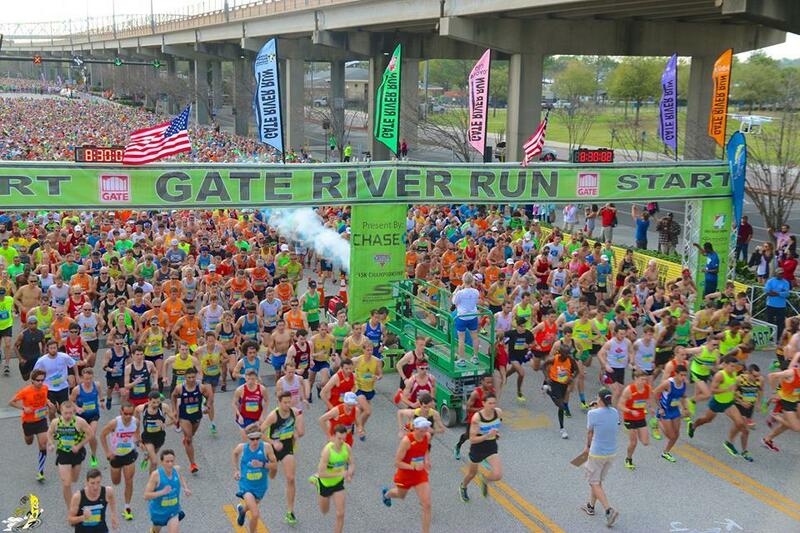 There are about 15,000 athletes in the Gate River Run 15K. Even with staggered starts for waves and corrals, it gets crowded. Really crowded. 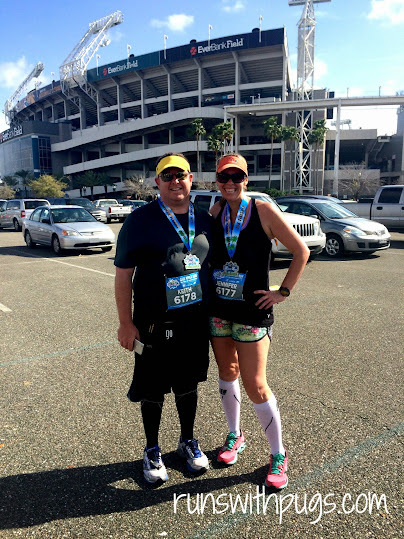 Kristin and I got separated pretty soon after the start line, and I fell in with a pack of runners as we made our way through downtown Jacksonville and to the first of two bridges: Main Street. Even with the metal grating and the wall-to-wall people, I like this bridge. It offers a beautiful view of the city and really isn’t too awful of a challenge, especially on fresh legs. As we turned into the San Marco area, I was struggling with my pace. I was having a really hard time getting around other runners and the constant speeding up and holding back was starting to wear on me a bit. This, combined with the humidity and heat was starting to tire me out a bit more than I was hoping. As usual, people were handing out all kinds of things along the route: donut holes, orange slices and cups of beer, to name just a few. 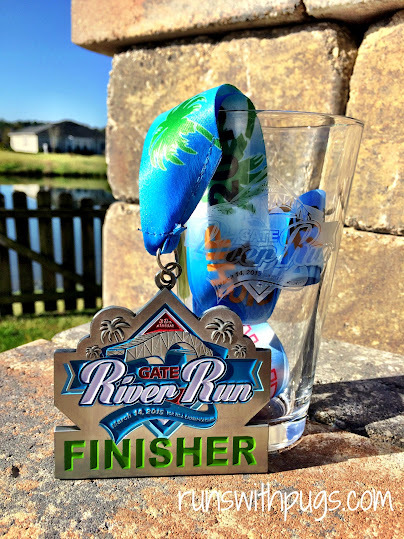 Early on, I wasn’t really in the mood for anything, but as the race wore on, I started thinking about the otter pops that would surely be passed out in a few miles. It was mostly overcast, but the sun did pop out from time time, unfortunately, in the areas where there was the least shade. I kept drinking Gatorade from my bottle, and pushing through. I may have stopped for a sip of mimosa, too. I couldn’t not. I had a pineapple popsicle, before I got to mile 6, which is just a hard stretch of the run. The crowds diminish here, and the course runs along an overpass, so there’s really nothing scenic to distract from the heat and the sound of shoes slapping pavement. By the time we reached the last road to the Hart Bridge (aka The Green Monster), I just wanted to be done. I took a salted caramel Gu to try to give myself an extra boost, but I was really looking forward to real food at the finish line. I scored another otter pop at the base of the aptly named Hart-breaker and started up. To my surprise, Kristin popped up behind me and we kept each other company, and even got pictures at the top. Finally, it was time for the descent. It’s a long downhill mile to the finish line, but it was so good to have an end in sight. With a last burst of energy, we were over the finish line. It wasn’t the race I wanted to have, but I got my PR! We all reunited back at the car to celebrate! And at long last, I got a nice, cold, refreshing adult beverage. Ahhhh. We hung out for a little while, and then it was time to check out of the hotel and head to a celebratory lunch at Hurricane’s with everyone. I love this race. It’s hard, with false flats and crowds and tight corners, but it’s home. 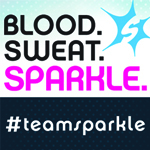 The volunteers and spectators are so amazing, and make every step part of a wonderful experience. Do you ever get to meet blog friends at events? What race feels like “home” to you? Woahhh congratulations on your PRc that’s fabulous! It was so wonderful to get to meet you too, hopefully we are able to again! Good point about the false flats in the middle, I confess I wasn’t expecting those. I remember that Kanye sign! Haha I needed it at that point in the race. My brother definitely stopped for beer from tr beer and sausage guys. I was so happy to meet you and to get that PR! The GATE follows a lot of the same course as the Marine Corps Half. The difference, besides another 4 miles, is that it’s hotter at Marine Corps and there is less crowd support. You have no idea how much those signs and beer guys matter until they’re not there anymore. That was the worst race of my running life, mostly because almost 6 miles of very subtle inclines trashed my legs, and my will to continue. 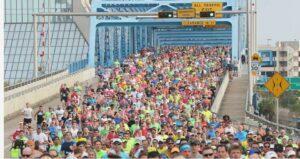 No matter how hard it is, running those bridges is just “right”. This race is so scenic! I can see why you love it despite it’s challenges. Nice work on the PR, especially in the stifling heat! False flats are my biggest demon. At least with a legitimate hill you know what’s going on. You can see why you’re struggling. 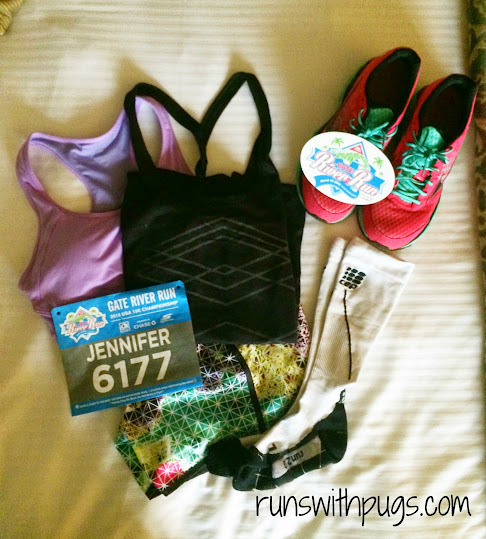 False flats just make you feel, well… UGH! I haven’t met any bloggers at races yet, though most of the ones I follow aren’t from my area. Maybe some day! It is really, really gorgeous. Jax is such a unique city, and I love getting to run through all of it. False flats are awful. Although, maybe if I made it a point to train on them more, they wouldn’t get me down LOL! 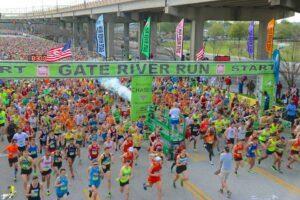 I hope I can run this one next year! Congrats on the PR and cute shorts! It would be awesome if you could come up! And thank you! These are my favorites! Sorry you did not have the race you wanted to, but congrats on improving upon last year! Abby @ BackAtSquareZero recently posted…A Breakup? Or Just on a Break? Improvement is always the name of the game! Congrats on the PR! That medal is gorgeous. Thank you! It’s one of my favorites (although I bet I say that a lot)! Congrats on your PR!! I like races in the Tampa/St. Pete/Clearwater area because I run there a lot so it feels like “home” to me. I also love mud runs anywhere and everywhere lol, because I love running off road! I totally get not having the race you wanted though, that’s happened to me before. Sometimes you have to just go with it! I have yet to do a mud run. I don’t know if I will ever get to that point (because I don’t like mud LOL! ), but it would be something to try once. Someone said to me once “You sometimes have to accept that you had the best race you had on that day, at that time, in those circumstances” and it’s been a great mantra for me. They’re not all going to be perfect or ideal or even great. And I’m learning to be ok with that. 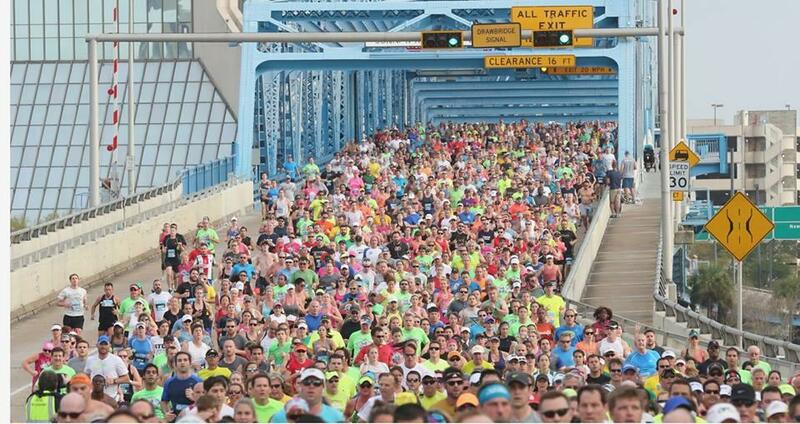 The race was super crowded this year. Last year I was in wave 3 and I think that’s the wave I might stick with. More room to run when you are the fastest in the slow wave as opposed to the slowest in the faster wave. Ha! It was pineapple! And it was so good! I was more to the back of the second wave last year, and this year I started closer to the front. Maybe that was the problem.